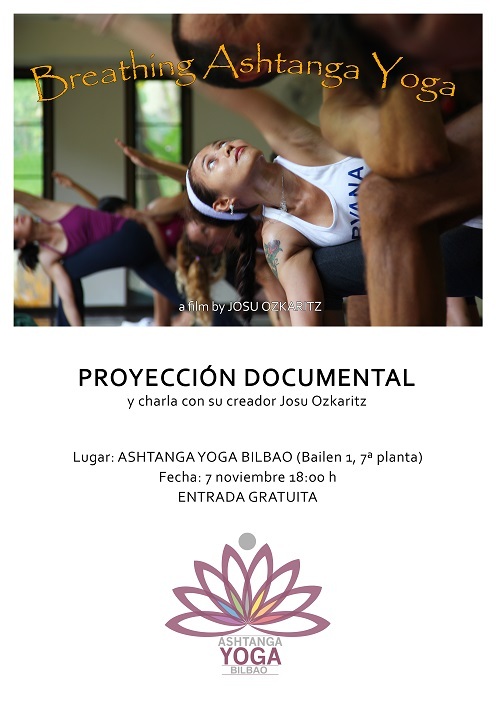 El sábado 7 de noviembre a las 18:00 horas proyectaremos en Ashtanga Yoga Bilbao el documental Breathing Ashtanga Yoga -Respirando Ashtanga Yoga-, en el que se recorre la historia y práctica de Ashtanga Yoga a través del testimonio de estudiantes y profesores que han "bebido" directamente de la fuente de la tradición. El evento es gratuito. Si quieres conocer los orígenes de esta transformadora disciplina y escuchar el impacto de su práctica mantenida a lo largo de muchos años, ¡no puedes faltar! Además, con nosotros estará Josu Ozkaritz, creador del documental, quien nos lo presentará y comentará. On Saturday, November the 7th at 18:00, at Ashtanga Yoga Bilbao we will show the documentary fim Breathing Ashtanga Yoga, in which the story and practice of Ashtanga Yoga is reviewed through the eyes of students and teachers who have "drunk" straight from the source of the tradition. The event is for free. If you want to know the origins of this transforming discipline and listen to the impact of its practice kept through many years, you cannot miss it! Besides, we will count with the presence of Josu Ozkaritz, creator of the documentary film, who will introduce and comment it to us. Larunbatean, azaroaren 7an 18:00etan Ashtanga Yoga Bilbon Breathing Ashtanga Yoga -Ashtanga Yoga arnasten- dokumentaria emango dugu, Ashtanga Yoga istorioa eta praktika tradizioaren iturritik zuzen "edan" duten ikasle eta irakasleen begien zehar ikusiz. Gertakizuna dohainikakoa da. Diziplina transformatzaile honen sorrerak ezagutu eta haren praktika urte askotan zehar mantendutako inpaktuari buruz entzun nahi baduzu, ezin zaitezke falta! Gainera, gurekin egongo da Josu Ozkaritz, dokumentalaren sortzaileak, aurkeztu eta azalduko diguna.